Complete pre-cut sets, which include one base liner and one wall liner to suit the size of your PTFE Cake Pan Baking Liner. Cut to size and place on the bottom and around the baking tin walls to bake pastries, biscuits, pie, fruitcakes, etc or placed on the bottom of your baking tray to bake meringues, flapjacks, pizza, oven chips, defrosting, etc. No need to try and clean your Bakeware, Cake Tin, Bread Tin after cooking a great meal! Just put the PTFE Cake Pan Baking Liner in the dishwasher, or wipe it with some kitchen towel. All those burnt on marks will be a tedious memory of the past. No need to buy expensive cleaners that don’t work, don’t scuff and scratch your expensive pans and utensils and make them look second hand. Just wipe them with kitchen towel. Nothing sticks to our bake ware liners / cake tin liners, its magic. No need for baking / parchment paper! 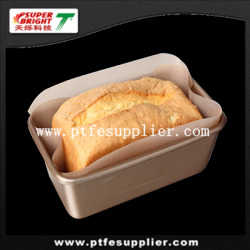 The PTFE Cake Pan Baking Liner come in different sizes, and can easily be cut to any size or shape with a pair of scissors to fit all tins and trays. Nothing sticks to our cake tin liners / bakeware liners, its magic!